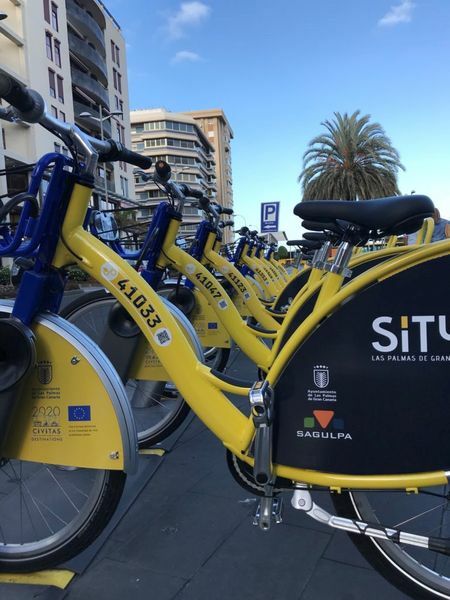 The innovative CIVITAS DESTINATIONS project – which includes the CPMR as a partner – is taking major strides forward in its work to improve cycling infrastructures on the European island cities of Las Palmas and Rethymno. DESTINATIONS, a four-year sustainable mobility project co-financed by H2020, involves cities in six islands from CPMR member regions and aims to develop innovative new initiatives to improve their tourism and transport without damaging the environment. As well as Las Palmas, in Gran Canaria, and Rethymno, in Crete, DESTINATIONS involves insular cities in the CPMR regions of Madeira, Cyprus, Malta and Tuscany (the communities of Rio & Portoferraio on the island of Elba). In Las Palmas, a well know tourist destination, the public bike system is being significantly improved and enlarged. And in Rethymno, which is visited by many thousands of tourists every year, the existing public bike sharing system is being replaced by an innovative dockless e-bike sharing system. Panos Coroyannakis, CIVITAS DESTINATIONS Director of Communications, said: “The DESTINATIONS project’s activities in these islands cities are excellent examples of introducing ‘Car Independent Lifestyles’ and changing the mindsets of tourists and citizens alike towards sustainable mobility in touristic destinations in the Atlantic and the Mediterranean”. A total of 40 bike stations have now been installed in Las Palmas (five of which have smart totems placed at touristic areas), along with 20 e-bikes, 375 smart bikes and two adapted bikes accessible for physically impaired people. The previous system had 150 bikes and 13 bike stations located all over the low part of the city. This is expected to lead to increased satisfaction among tourists and the local public about the quality of mobility services, an increase in the total share of citizens and tourists that use sustainable modes of transport, enhancement of social cohesion and a reduction in noise, emissions and fuel consumption. There will also be increase in the use of cycling, boosting people’s health and exercise, an improvement in accessibility for the physically impaired, and the introduction of innovative biking systems and vehicles. The aim in Rethymno is to improve the current bike sharing system with upgraded payment methods, make 300 e-bikes available in the wider area, along with one e-bike for disabled people, and promote a sharing mobility culture, developed by changing people’s behaviour through tools such as research defined clusters and mobile apps. This work is being developed thanks to effective cooperation between the public and private sector organisations involved. The activities implemented in the city so far include a study on potential improvements to the existing bike sharing system, cooperation with private operators to launch, operate and maintain a dockless system within the Municipality, the creation of the mobile app, and a public consultation workshop to raise awareness and engage residents and tourists on sharing mobility. The main objectives are to increase cycling, by increasing bikes available for sharing, increase the number citizens using sustainable mobility modes, challenge the introduction of car/ taxi sharing use, and reduce the use of single occupancy vehicles. Find out more about the work of the Civitas DESTINATION project.